To Cite: Guicheng W, Xuan A, Yi X, Fang W, Lina X, et al. Effect of Cytotoxic T Lymphocytes Induced by Recombinant Adeno-Associated Virus on Different Hepatitis B Virus Genes, Hepat Mon. 2017 ; 17(5):e42685. doi: 10.5812/hepatmon.42685. Background: Hepatitis B virus (HBV) infection is a significant global problem. The main therapies for chronic hepatitis B are nucleos(t)ide analogues (NAs) and (pegylated) interferon (IFN). However, the prognosis of chronic hepatitis B is still not so optimistic since the low serological conversion rate and the high recurrence rate after drug withdrawal. Objectives: This aim was to evaluate the killing activity of cytotoxic T lymphocytes (CTLs) induced by dendritic cells transduced recombinant adenovirus associated virus (rAAV) with different hepatitis B virus gene fragment (HBV-S, C, E, X). Methods: Peripheral blood mononuclear cells (PBMCs) were extracted from chronic hepatitis B patients , and the adhered cells were harvested to cultivate with recombinant adeno-associated virus with different hepatitis B virus (HBV) antigen gene fragment (rAAV-HBV-S, C, E, X) for 7 days by adding GM-CSF, IL-4 and TNF-α to generate mature dendritic cells (DCs). The DCs’ state were observed and their differentiation antigen molecules (CD) were detected by flow cytometry (FACS) to evaluate their maturation and function. DCs were co-cultured with prepared T lymphocytes to induce cytotoxic T lymphocytes (CTLs). The activity of CTLs induced by different DCs were compared by detection of lymphocyte CD molecules and cytokine levels. HepaG2.2.15 cells were target cells and HepaG2 cells as control. The specific killing activity of CTLs were compared by cell killing assay using 3-(4, 5-dimethylthiazol-2-yl)-5(3-carboxymethoxyphenyl)-2-(4-sulfopheny)-2H-tetrazolium (MTS). Results: The expression of phenotype CD14, CD80, CD83, CD86 from DCs transduced with rAAV-HBV-S, C, E, X and the secretion of cytokine IL-10, IL-12 were compared, respectively. CD80 in rAAV-HBV-S was the highest (P < 0.05), and CD83 in rAAV-HBV-X was the highest (P<0.05), but other results were not significantly different (P > 0.05). The response of cytotoxic T-lymphocytes induced by different adeno-associated virus (AAV) vector delivery into dendritic cells had significant differences. In comparing the four antigens in terms of CD4+CD25+T cells, it was found that rAAV HBV-E group was the highest, and rAAV HBV-X group was the lowest (P < 0.05); CD8+ CD69 + T cells in rAAV HBV-X group was the highest, and rAAV HBV-S group was the lowest (P < 0.05); IFN-γ levels secreted by CTLs in rAAV HBV-X group was the highest, and rAAV HBV-S group was the lowest (P < 0.05).The specific cell killing activity of CTLs induced by DCs transduced by rAAV-HBV-X to the HepaG2.2.15 cells was the highest, but the four groups were no significant difference, respectively (P > 0.05). Conclusions: These data suggest that rAAV-HBV-S, C, E, X delivery into DC may be all useful for immunotherapeutic strategies against hepatitis B virus infection and that the HBV X antigen gene may be the most useful. Hepatitis B virus (HBV) infection is a significant global problem with an estimated 350 million people carried HBV and one million cases died of HBV related liver disease per year. The main therapies for chronic hepatitis B are nucleos(t)ide analogues (NAs) and (pegylated) interferon (IFN) (1, 2). Even though a certain efficiency of inhibiting hepatitis B virus (HBV) replication they had, the prognosis of chronic hepatitis B is still not so optimistic since the low serological conversion rate and the high recurrence rate after drug withdrawal (2-4). Thus, new methods of treating chronic hepatitis B are urgent requests of patients. Large amounts of studies have shown that the mechanisms of chronic HBV infection are associated with the low ability of HBV recognition (mainly the antigen presentation function of DC) and the disability in fully stimulating the function of the cytotoxic T lymphocyte (5-7). Therefore, an effective way to activate specific cytotoxic activity to HBV infected hepatocytes could be the key to cure chronic hepatitis. Previous studies showed that recombinant adeno-associated virus (rAAV) vector delivered DC can induce antigen specific cytotoxic T lymphocyte (CTL) reaction (8-11). In our study, rAAV vectors carrying hepatitis B virus (HBV) antigen gene fragments were transferred into DC from chronic hepatitis B patients, to observe the cytotoxic effect of HBV antigens specific cytotoxic T lymphocyte (CTL), which may lay a foundation for clinical application on chronic hepatitis B patients. According to the guideline of prevention and treatment for chronic hepatitis B (2010 version) from Chinese society of hepatology and Chinese society of infectious diseases, Chinese medical association. This proposal is not a clinical trial, however, our study was approved by the ethics committee of chongqing three gorges central hospital (registration number: 2012-11) and in accordance with the declaration of Helsinki. Informed consents were acquired by the patients (total number n = 3, Table 1). They were HBeAg antigen positive and anti-HBe negative chronic viral hepatitis patients, with high serum HBV DNA load. All patients had never been anti-viral treated before and were not complicated by viral hepatitis A, C, D, E, alcoholic hepatitis, autoimmune hepatitis, drug-indued hepatitis and hepatocellular carcinoma. The cytokines granulocyte-macrophage colony-stimulating factor (GM-CSF), interleukin 4 (IL-4), interleukin 2 (IL-2), tumor necrosis factor alpha (TNF-α) were purchased from PeproTech (Rocky Hill, NJ, USA). The AIM-V medium and fetal bovine serum (FBS) were from GibcoTM (Grand land, NY, USA). Primary antibodies including anti-HBV-S, anti-HBV-E, anti-HBV-C and anti-HBV-X were purchased from Abcam® (Cambridge, MA, USA). Fluorescein isothiocyanate (FITC) conjugated secondary antibody and isotype control antibody were purchased from BD (Franklin Lakes, NJ, USA). The recombined adeno-associated virus rAAV/HBV-S, rAAV/HBV-E, rAAV/HBV-C, rAAV/HBV-X were kindly donated by professor Liu Yong (university of Arkansas for medical sciences, Little Rock, USA) (11). Viral titer was 107 copies / ml or more. Cell lines of human hepatocellular carcinoma cell line HepG2 and HepG2.2.15 cells were purchased from China Center for Type Culture Collection (CCTCC). HepG2.2.15 cells were HepG2 cells lines transfected with HBV gene and stably expressed HBV virus. The MHC-I class antigen of target cells (HepG2 and HepG2.2.15 cells) were matched to the patients. Dendritic cells were generated from PBMC via inducing with IL-2 and GM-SCF, and resuspended in AIM-V medium. After being cultured at 37°C and 5% CO2 for 3 hours in incubator, DCs were infected with different rAAV vectors (rAAV/HBV-S, rAAV/HBV-E, rAAV/HBV-C, rAAV/HBV-X and AAV as blank control) making the final MOI to be 100. The infected cells were then cultured in AIM-V medium containing 900U/mL recombinant human GM-CSF at 37°C and 6% CO2 overnight. The cell culture supernatant was replaced with fresh medium containing GM-CSF and IL-4 (900 U/mL) every other day. At the fifth day, TNF-α was added into the culture medium. Over another two days, we got rAAV/HBV-infected DCs, which were expected to express particular HBV antigens. The expression of HBV antigens of the infected DCs were detected by flow cytometry (FCM) in routine method. After being infected with rAAV/HBV vectors or blank control AAV, DCs were harvested and washed with phosphate buffer solution (PBS) three times. The infected DCs were next fixed with 4% paraformaldehyde for 15 minutes at room temperature, and quick span in centrifuge, abandoned the supernatant. Before further processing, DCs were permeabilized penetration agent (PBS solution containing 1% BSA, 0.1% saponin and 0.24% HEPES). The cells were subsequently incubated with primary antibodies anti-HBV-S, anti-HBV-E, anti-HBV-E and anti-HBV-X, and stained with FITC-conjugated monoclonal antibody. The detection was performed with Guava® easyCyte flow cytometers (Merck Millipore). Data analysis was processed on the cell quest software from BD (Becton, Dickinson and company). Having been infected with rAAV/HBV vectors, the monocytes were collected and resuspended in PBS containing 1% FBS. Those cells were then incubated with FITC- or PE-labeled monoclonal antibodies against CD14, CD80, CD83, CD86, IL-10 and IL-12 respectively for 30 minutes at room temperature. After washing twice with PBS and centrifuging at 1200 rpm for 5 minutes, the cells were detected by flow cytometer. The fluorescence intensities of each marker showed their expressions on different DCs. HBV specific cytotoxic T lymphocytes (CTL) were induced from autologous PBMC by co-culture with AAV/HBV infected DCs. Autologous PBMC was mixed with mature AAV/HBV infected DCs respectively with a ratio of 20:1 (12), and co-cultured in AIM-V medium which contains cytokines GM-CSF, IL-2 and IL-7. Medium were half-replaced each two days until the ninth day of co-culture when the HBV-specific CTL was matured and prepared for further surface type analysis. As described above, the phenotype of HBV-specific CTL was determined by means of FCM. T lymphocytes were detached from the culture vessels, washed with 1% PBS solution, and resuspended in AMI-V medium. CTLs were then fixed and permeabilized prior to stain with antibodies against CD4, CD8, CD56, CD25, CD69, and IFN-γ. Quantities of each T lymphocyte subset were counted and analyzed by FACS. The cytotoxicity of HBV-specific CTL to HepG2 and HepG2.2.15 were measured using the MTS reagent. HBV-specific CTLs and target cells (HepG2 or HepG2.2.15) were mixed in a ratio of 1:20, and then planted into 96-well plates culturing in CO2 incubator at 37°C for 6 hours. MTS reagent was added into each well in a concentration of 10% V/V. Being incubating for another 1 hour, the cells were placed in a microplate spectrophotometer to measure their optical densities (OD) at 490 nm wavelength. Statistical analysis were mainly conducted by SPSS Statistics 21. Comparisons of continuous variables in the study were carried out by student-Newman-Keuls test, while discrete data were analyzed using nonparametric ANOVA test. When P value was less than 0.05, difference could be considered as statistically significant. To explore cytotoxicity of HBV induced CTL, one crucial step was to infect dendritic cells, which were separated and induced from peripheral blood of HBV patients, with rAAV/HBV-S, rAAV/HBV-E, rAAV/HBV-C and rAAV/HBV-X vectors respectively. The expression of relevant HBV antigens in each rAAV/HBV infected DCs were detected by FMC. The percentage of DC expressing relevant HBV antigens were considered to be the infection efficiency of the AAV/HBV vectors. The final result of infection efficiency shows in Figure 1 that all the rAAV/HBV vectors were successfully transduced into DCs, with the average infection efficiencies being rAAV/HBV-S 86.87%, rAAV/HBV-E 89.51%, rAAV/HBV-C 85.03% and rAAV/HBV-X 89.40%. The subtle difference of infection efficiency among each rAAV vector was not statistically significant (P > 0.05). Mature DCs were separated from PBMC and induced by cytokines. Therefore, it’s necessary to characterize the rAAV/HBV vectors transduced DCs for validating their viabilities. DC surface marker phenotype was analyzed by flow cytometry as it is described in the material and method part. Expressions of DC surface marker CD14, CD80, CD83, CD86 and secretary cytokines IL-10, IL-12 in rAAV/HBV vectors transduced DCs were demonstrated in Table 2. The results indicate that rAAV/HBV vectors transduced DCs could function well to delivery HBV antigen. Autologous PBMCs were turned into HBV-specific cytotoxic lymphocyte after co-culturing with rAAV/HBV transduced DCs. To validate their characters, we detected the HBV-specific CTLs, which express both CD4 and CD25, or both CD8 and CD69. Typical results of the cluster of differentiation antigens are demonstrated in Figure 2A and Figure 3A. As is shown in Figure 2B, in the experiment groups HBV-S, HBV-E, HBV-C, and HBV-X, CD4 and CD25 positive (CD4+CD25+) CTL takes only a small proportion just as that in the blank control. Even so, HBV-S specific CTL and HBV-X specific CTL have significantly lower CD4+CD25+ level compared with blank control (Table 3). The expressions of CD8 + CD69 + in CTLs induced by rAAV/HBV vectors are significantly higher than the blank control (Figure 3, Table 3), in which HBV-X specific CTL expressed the highest with the average cell proportion being 55.99 ± 1.53%. Additionally, we analyzed the IFN-γ level of the HBV-specific CTLs. 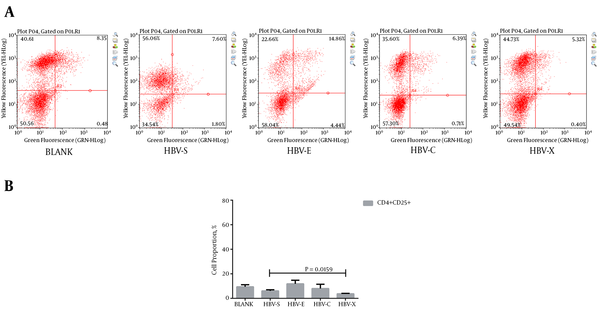 Figure 4 reveals that the IFN-γ level of HBV-specific CTLs were higher than the blank control, and HBV-X specific CTL expressed more IFN-γ compared with other groups. A, Dot plot of CD4+ and CD25+ cell analysis by flow cytometry method; B, proportions of CD4+CD25+ cytotoxic lymphocytes in each group. A, Dot plot of CD8+ and CD69+ cell analysis by flow cytometry method; B, proportions of CD8+ CD69+ CTLs in each group. A, distribution histogram of IFN-γ analyzed by flow cytometry method; B, proportions of IFN-γ cytotoxic lymphocytes in each group. CTLs were activated by rAAV/HBV transduced DCs which express HBV antigens HBsAg, HBeAg, HBcAg and HbxAg, and proved to express IFN-γ in the previous experiment. Thus, the activated CTLs were supposed to specifically kill HBV infected cells. To verify this hypothesis, we employed human liver cancer cell line HepG2.2.15, which express HBV antigens, and its parental cell line HepG2, which could not express HBV antigens. Cell killing was detected by MTS assay as described above. Cell killing rates were calculated from the OD values of cells being treated with HBV-specific CTL. Over one half HepG2.2.15 cells were killed by rAAV/HBV activated CTLs. The average cell killing rates in each group were HBV-S 53.01%, HBV-E 52.02%, HBV-C 51.06% and HBV-X 58.90%. It is revealed in the result that CTL in the HBV-X group has a higher cytotoxicity to HepG2.2.15 than other group, but the difference do not statistically significant (Table 4). This kind of cytotoxicity, however, was significantly weaker in HepG2 cells (P < 0.05) (Figure 5). Moreover, blank control CTL had extremely weak killing effects on HepG2 and HepG2.2.15 cells. The result reveals that the CTLs may specifically effect HBV infected cells. In the natural history of HBV infection, patients may carry HBV for a long time, or clear it spontaneously, which depend on their immune function. Unfortunately, for most patients, HBV escapes from the immune surveillance and leads to chronic hepatitis B which may developed into liver failure, cirrhosis or even cancer (1, 5, 13). In recent years, the research of treating chronic HBV carriers with DC, which derived from HBsAg protein antigen sensitized peripheral blood mononuclear cell (PBMC) showed that the sensitized peripheral blood dendritic cell infusion can effectively suppress virus replication, decrease virus antigen level, promote the serological conversion of HBeAg/HBeAb (11, 14). In HBV transgenic mice, researcher from Dai’s team employed the lentiviral vector encoding ubiquitinated HBcAg as a therapeutic vaccine to turn on cellular immune responses, demonstrating that HBV DNA level and HBV antigens in liver tissue of the mice were decreased (15). Another study shown the potential therapeutic effect of a novel complex HBV preS vaccine on preventing HBV infection in mice (16). However, HBV transgenic mice is quite different from chronic hepatitis B patients. Several studies were tried to activate the immune clearance process of HBV by simulating the human body’s cellular immune function in vitro (15-19). Peripheral blood dendritic cells were stimulated with HBsAg and presented the antigen to CD8+ T lymphocyte which was expected to transform into HBV-specific cytotoxic T lymphocyte. Disappointingly, these effects are not so satisfactory. The main reasons could be the short half-life and fast degradation of protein antigen and inadequate stimulation of DC. To acquire long-term and high efficient stimulating for DC, there are various approaches to transduce HBV antigen gene fragments into DC, such as liposome, nanocapsule, adenovirus vector, lentiviral vector, and adeno-associated virus (15, 16, 20). AAV is a defective virus and produce low immunogenic protein. AAV can effectively infect all sorts of human cells that means DC could be the host cell. Previous studies showed that the efficiency of AAV infected DC could be up to 90% (19), which is consistent with our result that each rAAV/HBV vector has an average infection efficiency over 85%. AAV can be directly integrated in 19 chromosomes, then express the carried purpose gene persistently and stably (21). Thus, AAV has higher stability and security than other gene vectors like adenovirus vector and retroviral vector (15, 22). Recombinant AAV is more likely employed for clinical use and has been applied in researches of curing cancers (10, 23, 24). Thus, we choose AAV to carry HBV gene fragments in this study, and transduced rAAV/HBV-S, rAAV/HBV-E, rAAV/HBV-C, rAAV/HBV-X vectors into Mo/DC respectively. In this study, we induced HBV antigens specific CTLs from PBMC with the assistance of rAAV/HBV vectors. We subsequently detected the cytotoxic effects of each HBV antigen specific CTL for HepG2 cell and HepG2.2.15 cell. As is well-known that HepG2.2.15 cell line is able to produce Dane particles, HBV antigen specific CTLs may affect HepG2.2.15 cells. Our study revealed that the HBV-specific CTLs may significantly kill HepG2.2.15 cell, while effects litter to HepG2 cell. This indicates that the rAAV-based method may be a novel approach to cure chronic HBV infection. Interestingly, when analyzing the phenotype of CTLs, we found that HBV-X group has remarkable higher CD8+CD69+ level and γ-IFN level than other groups, and a higher cell killing rate to HepG2.2.15 even not statistically significant. It suggested that HBV X antigen may be more useful in activating cellular immune-response than other HBV antigens. This study maybe the first time to observe loading four gene fragments of HBV by AAV into DC to induced CTL effect. However, this research just refer to HBeAg antigen positive chronic hepatitis B patients and could not represent chronic hepatitis B patient in different immune status, which is the limitations of this study. Thus, there is a lot of work for us to do before clinical use. Further researches should focus on HBV-DNA level change, serological conversion of HBeAg/HBeAb, and influence for the physiology and pathology of HBV infected hepatocyte both in vitro and in vivo. All the authors appreciate every chronic hepatitis B patients for their voluntarily participating in this study. And we are grateful to the physicians and nurses for recruiting volunteer and collecting clinical specimens, in liver central, Chongqing Three Gorges Central Hospital. Funding/Support: This study was supported by the National Natural Science Fund project of Chongqing (No. cats2012jjA10110).